Welcome to Google Home Hub—the newest member of the Google Home family, bringing you help at a glance. With the Google Assistant built in, you can use your voice to get the best of Google—Search, Calendar, Maps, YouTube, Google Photos and more–right on Hub’s display. The first thing you’ll notice about Hub is its beautiful design. We made this display to fit right into your home, and we hope you’ll consider it not just functional, but part of your decor. Its 7” screen is like a floating display, just the right size to fit on any surface and big enough to enjoy your photos from across the room. With soft rounded corners, Hub fits naturally on any surface. My favourite places are my kitchen counter and nightstand. Available in Chalk and Charcoal across partner retailers, and also in Aqua and Sand on the Google Store. We consciously decided to not include a camera on Google Home Hub, so you feel comfortable placing it in the private spaces of your home, like the bedroom. On the top of the device you’ll find the powerful Google Home Hub’s Ambient EQ light sensor. It allows the screen to automatically adjust to match the lighting in the room, so photos on Google Home Hub will blend in with the room, too. That means no glowing screen—it fits seamlessly into your home. When it's time for bed, Hub knows to dim the screen for a good night’s sleep. The Google Assistant works with more than 5,000 devices worldwide, and 100+ home automation devices from more than 50 brands here in Australia—including Nest, TP-Link, Philips Hue and more. With Hub, everyone in the family can see and control your compatible devices from a single dashboard—no more switching between apps. Just swipe down to reveal your home view: dim your lights, turn up the volume on the TV, and see who is outside with your Nest Cam Outdoor. You can also broadcast messages through all connected speakers in your home, just say “Hey Google, broadcast dinner’s ready!” to round up the family. Google Home Hub is also a photo frame, but not your average one: It's easy to set up, automatically refreshes the photos that are displayed, and features your best shots. With Live Albums, a new feature from Google Photos, I can relive recent memories with family and friends even while Hub is not in use. Google Photos will automatically add new photos of my son and our dog to my album, avoiding duplicates and blurry shots. I can even share our Live Album with my mum, so when she sets up her Google Home Hub, the photos of her grandson will be added to the live album automatically. Plus, you can say goodbye to endless scrolling on your phone to find the photo you’re looking for. Google Home Hub makes it easy: “Hey Google, show my pictures from the Grand Canyon,” and just like that, I'm taken back to my vacation. My family spends a lot of time in our kitchen, and Google Home Hub helps us prepare recipes like top chefs. I can use my voice to browse millions of recipes and start cooking, all hands-free. We’ve teamed up with Woolworths, Genius Kitchen, Food Network and others to bring their fun, family-friendly recipe videos to Google Home Hub. Check out the Woolworths lamington recipe for a fun how-to recipe, it’s delicious! At my house, Fridays are family night—and sometimes that means a dance-off. Hub’s full-range speaker means a crisp, clear sound every time. With Hub, you can enjoy music from YouTube, Spotify, TuneIn Radio and other popular music services (you may need a subscription). Eligible customers activating Hub before December 31, 2018 can also get a six month trial of YouTube Premium on us, to enjoy not just YouTube Music, but all of YouTube ad-free (restrictions and terms apply). When you’re ready for bed, just say, “Hey Google, good night” to set an alarm, turn off compatible lights and TVs and fall asleep to soothing music. You can use ready-made or custom Routines to create your own Routine with any of the Google Assistant’s one million actions, starting your routine with a phrase that feels best for you. For busy working parents like me, every day is hectic—so these features are truly game-changing when I have my hands full or I’m strapped for time. I know you’ll love getting help and enjoying family time with Hub, just like my family. 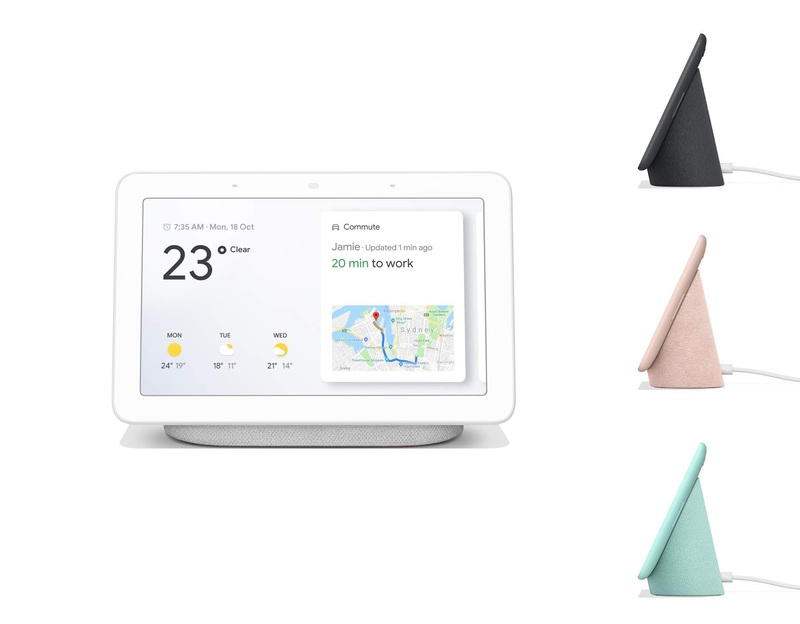 Google Home Hub’s RRP is $219. You can pre-order it today and buy it from October 23 at JB Hi-Fi, Harvey Norman, Officeworks, The Good Guys, Optus, Vodafone and Google Store (colour availability will vary). Once you set up Hub, just say “Hey Google, what can you do” to get started.